As an advance warning, this post is going to be all over the place. Let's start with the recent purchases. As some of you might be aware, I'm desperate to make Helen a pair of knee high socks, and I now have the yarn, the pattern, and the needles. I was pretty thrilled when the Interweave Summer 2007 issue got to me, but I can only see about four patterns in it that I'd ever really make. The issue is worth is since I really want to make those patterns and I am terribly grateful for the toe-up sock instruction. I did start the socks tonight, but for the first time out of all the socks, mittens, scarves, and hats I've made, I twisted my work when I joined it. I was horribly disappointed and I set the yarn and needles aside to work on my other simple anklets. My anklets are a simple stockinette sock with a short row heel. This is my preferred sock for myself. It normally requires less than 200 yards for me as I have relatively small feet. The Koigu I'm using for my anklets is nice, but I'm tired of blue. How is it that I fall in love with yarns when in skein form, but then hate them when they get knit up? I also bought Custom Knits recently. I follow Knit and Tonic pretty faithfully simply because I love Wendy's patterns, so I knew the book was coming out. Wendy's patterns are often classically beautiful or truly fashionable. They are the type of sweaters that I'd buy if I were to go to a nice store at the mall. Now, I love to knit, but I'm not one to just knit a sweater to knit a sweater. I need to know that I'm going to at least think I might like the ending result of my knitting prior to starting to knit. (This is why I knit so many damn scarves and socks and hats and mittens. No matter what, I know I'll wear these things. It's also why I knit for other people who are less picky than me such as my mom.) This is why Wendy's patterns are perfect for me. I know that I want to knit them because they look cute or pretty or classic. I've already decided to knit Pink, the Karma Tank, and Tang from the book (eventually). I just need to buy some yarn for this first and then finish all the other projects I have queued up already. I hate to have yarn for more than five or six projects around the house. I know, I only like to knit on one thing at a time normally, and I hate to stash. I'm an abnormal knitter in the internet blogging world, aren't I? Let's get to the Podcast Reviews. I'm still working through old Podcasts, but I can tell you that I've decided I kind of like Knitting at Night. Even though I have a hard time identifying with the podcaster, Casey, I find her voice nice and the balance she has between personal stories and knitting information to be quite good. I'm glad that I gave her a try after her first several episodes which had sound problems. Because she has a lengthy backlog of episodes, and because she podcasts pretty much weekly without fail, I have not gotten to any new podcasts this week. I've barely kept up with the ones I love that have come out this week! YarnCraft came out with episode 23. It was all about yarn based crafts for or with children. Well, that effectively killed me giving YarnCraft another try for a while. I have listened to three episodes and I just have not been impressed. It seems, largely, like an advertisement for Lion Brand Yarn, and I don't knit with their yarn. I don't get much out of the episodes, and I don't have the time to dedicate to them. I might give them a try another half year or year from now. Remind myself -- try Cast On in two months and YarnCraft in a year. 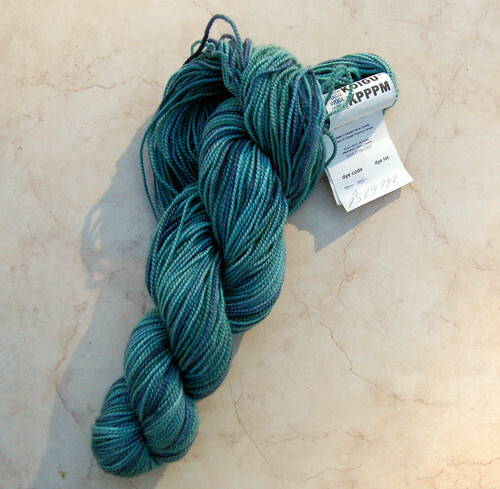 I also got the latest episode of Yarn Thing due to her comments on my blog. I'll give her Season Two a try. Knit Pick's Episode 62 was another interview and I loathe when she interviews, so I just deleted it without thinking about it further. I've got too little time in life for crappy episodes of her podcast. It's a real shame too, because I normally love the Knit Pick's podcast and I want to hear about their yarns and her knitting queue. Bah! Pixie Purls put out a new podcast, episode 19! Unfortunately, I listened to her episode while extremely tired, but she had a new feature that I loved. She highlighted other people's Finished Objects that she had liked. I couldn't resist looking at the posts she linked. She also discussed whether Ravelry and Flickr have killed knitting blogs. This was an interesting topic, but she's had better. Manic Purl put out a new episode as well. Her episode 10 was okay, but she too has had better. 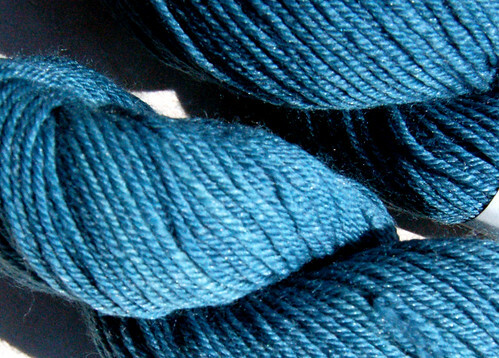 I was going to talk about sock yarns I've fallen in love with recently, but this post is already hideously long. It'll wait until next time. As some of you don't know me very well, I'm going to be giving up my job very soon, which is causing me a lot of depression. However, this might mean that I'll have more time for posting. I might try to enforce a twice a week posting schedule if that occurs, to be upgraded to three times a week if twice a week works well. So, sometime in July, when I had a lot more free time on my hands, I promised I'd review some more podcasts. Well, I went back to work and my free time went to hell. I could choose to either blog or sleep. I normally choose sleep nowadays. I did, however, have a LOT of time to listen to podcasts over the last month since my commute jumped to two hours each way normally. That left me time to go through podcast after podcast. Since it is still before 23:00 right now, I'm going to review a few of those podcasts. Yarn Craft is... Well, I'm not really sure what it is. I've only listened to two episodes, and I haven't really got a feel for it yet. This is one of the few I've listened to that I haven't started near the beginning. It's two women who work for Lion Brand Yarns chatting together. I don't know if I have a feel for their personalities yet, but I am going to give it more time to grow on me. Since they always talk about yarns from Lion Brand, I'm often not thrilled since I haven't used Lion Brand yarn in about five years now, but I am still willing to give it a few more listens. I loved, loved, loved the early episodes of Manic Purl. She speaks about things I find interesting, she loves to review various yarns, or give me knitting news. Thanks to her, I know there is still a chance to join one of those Mystery Shawl things. In the last few episodes, she's gotten a little bit disorganized. While I do appreciate some impulsive moments in podcasts, I really do like highly organized podcasts better mainly because I think that a lot of disorganized podcasters end up 'um'ing a lot and forgetting what they say in the middle of their podcast. She's indicated this change is permanent, but I'm still going to listen to her future episodes. However, folks, my new favorite podcast might be Stash and Burn. These two friends have a natural flow and ebb to their conversation which is fantastic. Even when they are clearly showing each other things or going to the computer to find information, they are still interesting and on topic. It's both clear that they love knitting and yarn, and that they are friends who discuss it even when not podcasting. I can't recommend them enough to people who like to hear podcasts between duos. I'm still making up my mind on Knitting at Night, but I should review this podcast soon. I hope to add another two or three podcasts to that review list as well. I expect I'll have a chance to give Doubleknit a listen, so they might be on that list. I also hope to start reviewing individual episodes of each podcast I listen to. I wanted to add one thing, however. The podcaster for Yarn Thing, a nice woman called Marly, thanked me for my review even though it was not a positive one. I'd like to thank her for commenting, in turn. I would never have assumed any podcaster would see my blog, since it is not highly public and I'm not a well known knitter. Since she commented, I thought I'd explain, in further detail, why I didn't continue to listen to her podcast. I pictured my own baby having anything wrong with him, and I felt so horrible for any mother who had to go through watching her child or baby be in pain. I don't even know if I could be strong enough for my child if something happened to him like that. I admired her for thinking about other mothers and how she could make life easier for them. I remembered how miserable my step-father had been while going through his own chemotherapy. I never appreciated Ed while he was alive, but he was a very good man in his own way. I ended up going to his alma mater, Drexel University, and it was widely acknowledged how thrilled he would have been. My step-father died from his cancer. Okay, I'm going to start this post with how I made some socks for Nathan, and end with how I'm a giant moron. Follow along. First, let's start with the good. After more than a month of knitting, I've completed Nathan's socks. They fit him perfectly, which is worrisome since they are fall/winter socks and it is summer. But, he looks good in them. 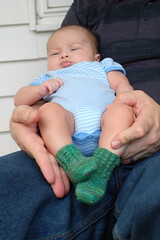 I made Paul go outside with him, in the heat, and made them both wear wool socks so I could get a photo for Ravelry. Since I've been so depressed and exhausted recently, Paul humored me. The cat in the background is Jade. She's staring hatefully at Nathan who she considers an interloper. Sometimes, when I cuddle Nathan, she tries to climb into my lap as well. I rather like the socks. They are adorable and especially cute for being matchy-matchy with his daddy's socks. I am looking to buy some kind of cashmere sock yarn and make him several larger pairs of socks for the upcoming year. Perhaps I could knit myself some cashmere socks while I'm doing so. I told Paul when I finished making Nathan's socks that I could not picture a situation where I had enough yardage after making another pair of socks where I would not make Nathan socks. Handknit socks for Nathan! Now, for the stupidity. Perhaps it is because I'm very tired recently, but I've been looking all over for Interweave Knitting Summer 2007 Issue. See, I really want to make Helen a pair of the boot socks, and I'd like to make myself the Montego Bay Scarf. So, logically for an old magazine, I looked on Ebay for it. And I kept bidding and getting sniped. I was so angry with the last one that I vowed to look around online for other stores that might be selling it and just buy it outright. Wait, while I was waiting for the magazine to come on, I cast on for new anklets for myself with some Koigu. Unfortunately, my knitting speed is basically nonexistant now, so Helen might never get these socks.